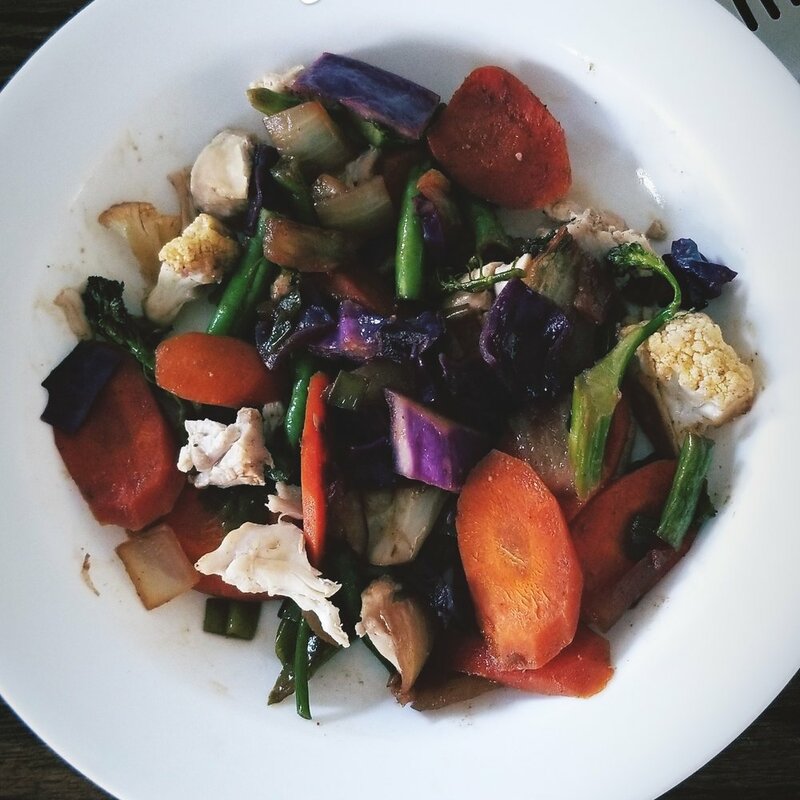 I think I finally landed on the best version of my No Prep, No Measure Asian Vegetable Stir Fry! I am so excited to share it with you today. I have shared it with friends and family to rave reviews. It has gone into many a family's weekly rotation -- it is both that easy and delicious. Different combinations of vegetables will definitely work, and if you don't have all the spices or liquid ingredients on hand, just throw in what you have. It'll still turn out great. I happen to be partial to this particular combination of vegetables because they taste great together, and I always have them on hand. Each of the vegetables included in this recipe is a yang vegetable and a prefered vegetable on Dr. L. Wilson's nutritional balancing program. If you don't usually buy or eat some of these, go ahead and give them a try and see what you think. You may be surprised at what you like! The combination of coconut aminos and cayenne pepper in this dish is a wonderful sweet and spicy culinary experience you will find sophisticated enough to serve to guests, but simple enough for weeknight meals with your family. I hope you love this one as much as I do! Put the above ingredients into the pressure cooker for 13 minutes. You can quick release if your vegetables are done at the same time. If you are still working on the vegetables when the chicken is done, just turn it off and allow the pressure to come down on its own. You are going to chop as you cook, so go ahead and put about a tablespoon of butter (preferred), ghee, or coconut oil in the pan and get it warming over medium/medium-high heat. While the pan heats, chop your onion and then add it to the pan. Peel and chop your carrot(s). I like mine really thinly sliced at an angle. I'm sure there's a fancy cooking term for this, but I don't remember it. Add the sliced carrots to the pan. Give the onions and carrots a stir, and add a sprinkle of salt. Next up, grab your green beans and cut them roughly into 1-2 inch pieces. Throw them in the pan. Get your cauliflower florets. Dice those up, and, you guessed it, add them to the pan. Give everything a good stir and adjust the heat lower if things are starting to brown too quickly. Get your broccolini (or broccoli) and chop the stalks at an angle like the carrots into 1 inch long pieces. It's just prettier that way. Keep the tops fairly intact. Add them to the pan, and give it all a good stir. Cut off a bit of your cabbage and dice it. Sprinkle it into the pan, breaking it up as you do. Finally, cut the whole green onion(s), white and green parts, into thin slices and add them to the pan. OK, you're done with the hard part. Your vegetables should be browning a little and smelling great. They should also still be pretty crunchy at this point. That's ok, we're going to add some spice and liquid to help them cook through. As you add the spices, try to spread them out over the whole pan. First, throw in a thin sprinkling of garlic powder and about half that of ginger powder. Feel free to use fresh for both if you want, just add them with the carrots and onions so they cook through. Next get a good sprinkling of Chinese Five Spice in the pan. You should use the most Chinese Five Spice compared to the others, but don't go heavy -- a little goes a long way. Add a pinch of white pepper and a pinch or two of cayenne pepper if you like some heat. That's it for the spices. Add just the smallest amount of lime juice (we're talking about a teaspoon) and about the same or a bit more of sesame seed oil. I also added a bit of Chinese cooking wine because I had it on hand. You can sub in rice vinegar or leave it out if you don't have either. Finally, add a healthy amount of coconut aminos (or tamari if you want it a little less sweet). Sprinkle it all over so it wets the spices. You should add enough to have a thin layer covering the bottom of the pan. That's it! Now, turn up the heat and boil off most of the coconut aminos, stirring occasionally. If your vegetables are still really crunchy, you may wish to cover the dish while it cooks for about 3 minutes. While the liquid is boiling off is a great time to wash your cutting board, knife and peeler so your kitchen is clean when you are ready to eat. When your chicken is ready, dice up the right amount of protein and add it to each plate. Pile the vegetables on top and enjoy!